https://youtu.be/ur3Gl0COTGo This unusual looking aircraft is a twin engine taildragger. While fascinating, those two characteristics might make you wonder if you can handle it. I believe anyone can, with proper training of course. Get by those uncertainties, I advise, because once you fly AirCam you may start thinking that any other aircraft simply won't do. For low level flying over interesting terrain or water, this is one of the safest aircaft ever. Flying the open cockpit aircraft is such a marvelous experience, I consider AirCam one of my all-time favorites. You might, too. This unusual looking aircraft is a twin engine taildragger. While fascinating, those two characteristics might make you wonder if you can handle it. I believe anyone can, with proper training of course. Get by those uncertainties, I advise, because once you fly AirCam you may start thinking that any other aircraft simply won’t do. For low level flying over interesting terrain or water, this is one of the safest aircaft ever. Flying the open cockpit aircraft is such a marvelous experience, I consider AirCam one of my all-time favorites. You might, too. In a show as vast at EAA's AirVenture Oshkosh, it is presumptuous to attempt covering everything of interest. What follows are some new aircraft I found in the categories I cover on this website. Other projects were certainly worthy of special note but with the goal of a fast dash through the latest and greatest, I'm keeping this one fairly lean. I'll cover other developments in subsequent articles. So, here's three aircraft you haven't seen before AirVenture 2016 plus a revised project involving an increasingly popular engine. I'll start off with a famous guy checking out a famous engine to propel one of my favorite airplanes. We begin our quick review with Lockwood Aircraft's AirCam. Of course, you know his face. When I once heard Harrison Ford speak, he said modestly (paraphrased), "I earn a living making faces." I never thought of acting in such simple terms, but I accept such skills are part of the job. He's made faces successfully enough in many movies to be able to afford several fun airplanes and now he's getting into an AirCam. Developer/manufacturer Phil Lockwood said, "We were keeping a low profile to preserve [Harrison's] privacy but the cat is out of the bag now." As an AirCam fan myself, I predict Ford's facial repertoire will frequently include a broad smile. The never-before-seen SkyCruiser offered by U.S. Sport Aircraft. The newest and perhaps most unexpected aircraft at the show was SkyCruiser offered in the USA by U.S. Sport Aircraft based in Texas. This U.S importer has long represented Czech Sport Aircraft's SportCruiser, which has ranked up high on our market share report for years. Literature for the new model makes no mention of CSA, instead referring to Czech 4 Sky. Nevertheless, U.S. 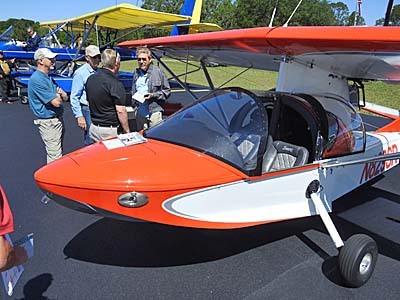 Sport Aircraft boss, Patrick Arnzen indicated he would bring in the new model from CSA. In this article I am covering aircraft that seem to be pushing the envelope but a sign of maturity in the LSA segment shows developments in all directions. One of those is a return to simpler, easy-to-fly aircraft. Looking somewhat like another very successful design, Aerotrek's A220, SkyCruiser represents a model from about one decade back. When the LSA regulation first created aviation's newest segment the typical customer was often someone seeking a carbon fiber speedster with autopilot, a full glass panel, and all manner of bells and whistles. Many developers stepped up to fill that demand and simpler (less costly) designs were left behind. Now, they're back! SkyCruiser, as seen on U.S. Sport Aircraft's Oshkosh space, is powered by a Rotax BRP 912 ULS, and tops out at 1,232 pound gross (88 pounds less than allowed as a SLSA). At a fairly modest 723 pounds empty, the taildragger still offers a 509 pound useful load or a payload of full fuel (17.6 gallons) and two 200-pound occupants with minimal baggage. Stall is listed at a slow 34 knots and maximum cruise is 86 knots. SkyCruiser appears to come well equipped with the latest from Dynon and more. 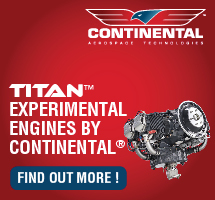 Kitfox's Titan engine installation was particular well achieved, like most Kitfox factory aircraft. Perhaps it is because of the success of CubCrafters, but the rush remains on for companies developing vintage-style aircraft with big engines. While Rotax continues to power the majority of light aircraft around the world using their ubiquitous 9-series engines, some builders want more. For slower airframes Cubalikes — to use a phrase coined by Bill Canino of Sportair USA, which also offers a muscular model in this same space — adding a massively powerful engine delivers supershort takeoffs and thrilling climb rates. 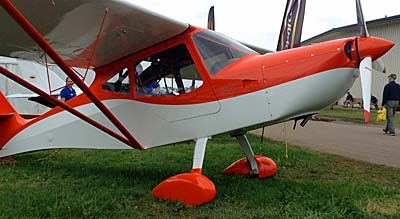 One very slick Titan installation appeared on a factory Kitfox brought to Oshkosh by owner John McBean. His team always does impressive detail and finish work and the Kitfox Titan seen nearby was a prime example. 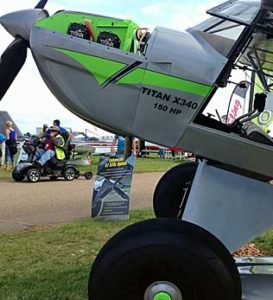 An airplane that works extremely well with Rotax (still offered, of course) should be nothing short of spectacular with the big Titan engine doing the pulling. I can't wait to fly this one! The new Triton American SkyTrek made its debut at AirVenture 2016. It may look familiar (indeed it has some common heritage) but Triton America's SkyTrek is a significantly different airplane than those it resembles. The airframe is smoother with more sweeping lines aft of the canopy. The structure is beefed up and able to handle a higher G loading. The nosewheel has been strengthened to last better in flight school use. A main difference in this model from others with similar overall looks is that SkyTrek is fabricated in China. Its principle designer, Tom Hsueh, has long been established in the USA and has worked with some of the largest aviation companies. Although Tom says, "I have a Chinese face," he works from offices in Washington State. His may be a new name to most readers, but I have been talking with Tom for a couple years and believe he can become a player in the U.S. marketplace as well as in China. To Triton's and Tom's credit, he reported the Chinese CAAC has certified SkyTrek for sale in that country. Not only a new manufacturer of Light-Sport Aircraft, Tom has bigger ambitions. 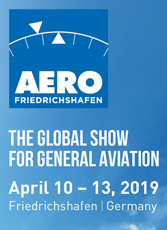 In 2009, Triton America, which does business as Triton Aerospace, acquired all the design rights and hardware inventory for Adam Aircraft, a company that formerly built and certified a six-seat, twin engine, twin-boom, pressurized, all-carbon-composite FAR 23 aircraft." 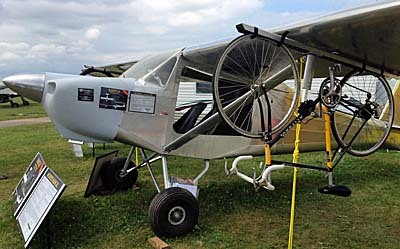 Murphy Aircraft is back with their new Radical, complete with dual bicycle racks. Designer Darryl Murphy is a cycling enthusiast. To wind up this brief look of new flying machines we come back to Murphy Aircraft Manufacturing, still run by founder Darryl Murphy and still based in Chilliwack, British Columbia, Canada. It's been nearly a decade since we saw any new light planes from this once-prolific producer. Darryl said that when the Canadian dollar soared high compared to the U.S. dollar, it became impossible to sell to Americans, by far his company's largest market. So, he used his large facility and impressive forming machinery to make aviation and other parts for different manufacturers. He seemed pleased about the return to building kits; welcome back, Darryl! While showing his new Radical, Darryl indicated he's been hearing from potential customers that they'd like a Special LSA Rebel and he reports work is proceeding on that in parallel. Meanwhile he introduced a new model that goes hand-in-glove with the new batch of higher powered, higher gross weight aircraft taking several companies beyond the Light-Sport space. This may be one artifact of the EAA/AOPA push to eliminate the third class medical. Darryl acknowledged Rebel is a good foundation for the Radical, however, the new model is essentially a brand new design. "With more payload, more wing area, and capable of using engines up to 220 horsepower, [Radical] will incorporate many of the best features of the Rebel, Elite, Maverick and Super Rebel," he said. Looking around Oshkosh, I found ultralight, light kit aircraft, and Light-Sport Aircraft all looking healthier than many seem to think. In addition, the arrival of the 180-horsepower Titan and even larger engines combined with higher gross weight/high payload designs seem created to appeal to those who no longer need a medical. The new program won't be effective for a year and still has hoops through which a pilot must jump, but it does open the door to new designs. 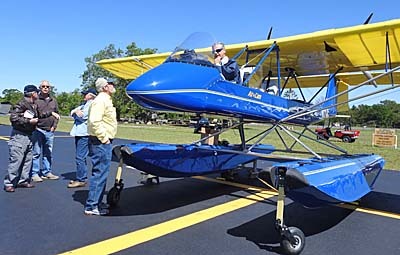 Light aircraft engineers and manufacturers seem up to the task and customers appeared intrigued by their new offerings. I'll have more from Oshkosh after catching up with other work, but I found the light sector very alive and doing quite well, with or without a third class medical. In a show as vast at EAA’s AirVenture Oshkosh, it is presumptuous to attempt covering everything of interest. What follows are some new aircraft I found in the categories I cover on this website. Other projects were certainly worthy of special note but with the goal of a fast dash through the latest and greatest, I’m keeping this one fairly lean. I’ll cover other developments in subsequent articles. So, here’s three aircraft you haven’t seen before AirVenture 2016 plus a revised project involving an increasingly popular engine. I’ll start off with a famous guy checking out a famous engine to propel one of my favorite airplanes. We begin our quick review with Lockwood Aircraft‘s AirCam. Of course, you know his face. 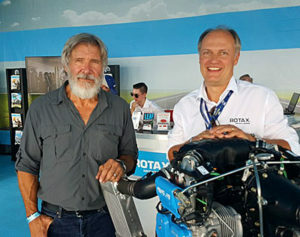 When I once heard Harrison Ford speak, he said modestly (paraphrased), “I earn a living making faces.” I never thought of acting in such simple terms, but I accept such skills are part of the job. This attention-getting "dragon" Air Cam is not Ron Owens' but it might qualify as "gnarly." As the next photo shows, this was a total treatment. This Air Cam may have demanding duties in remote areas, but that doesn't mean the paint job has to be dull. What would you like for a Christmas present, perhaps if you won big in a lottery? Well, you're a pilot so I might guess that some airplane has caught your fancy. Me, too. Like most pilots a number of desirable airplanes catch my eye but also like most pilots, I cannot afford to have one of each that appeals to me. High on my list of wished-for airplanes is Lockwood Aircraft's Air Cam. I have quite a few hours flying one example or another. I even earned my multiengine rating in one, as part of an article I wrote years ago. As part of the required hours of training to take the flight check — no written test is involved for a multiengine rating — I engaged an old friend and multiengine instructor, Richard Johnson. An Air Cam owner, Sebring dentist Ron Owen, graciously supplied his Air Cam. Richard and I flew all over central Florida in Ron's plane as I accumulated hours and experience. Richard and I crisscrossed the state at about 50 feet above ground level, often even lower. We flew over long stretches of orange groves barely 10 feet above the tree tops. Being a safety conscious pilot I cannot imagine doing that in, well ... any other airplane I've flown, Light-Sport, ultralight, or general aviation. When Richard and I approached an airport to do some multiengine preparation — to simulate an engine out on takeoff, for example — we had to climb. Yes, climb! After flying around at 50 feet AGL or less, you have to climb to enter the traffic pattern so you can land. Richard joked that we had to ascend to "nose bleed altitude." The online Urban Dictionary offers these synonyms for gnarly: awesome, cool, sweet, rad' (among others). I think these words express my sentiment. Oh, sure, Air Cam is no LSA (too many engines). It's no ultralight (too many seats, too heavy). It's not certified, being a 700 to 1,500-hour kit-built aircraft. Most who look lovingly at Air Cam see it as somewhat costly (though even with two expensive engines it's priced less than many high-end LSA). Regardless, I love Air Cam as one of the most thrilling airplanes I've ever flown. If you haven't sampled it, you have a great experience ahead of you. Of course, you should never do reckless or unsafe operations in any airplane but Air Cam behaves differently than nearly any other aircraft. I have executed a single engine take-off in the machine, just to prove it could be done. I was careful to have plenty of runway and no traffic but most twin aircraft wouldn't — indeed, cannot — even attempt such a feat. When losing an engine in Air Cam, the event is almost hard to notice ... unbelievable, perhaps, but factual. Air Cam can climb 300 feet per minute on one engine. These capabilities make flying low over orange groves an acceptable flight. People who own an Air Cam are as diverse as folks who buy any other airplane. However, I've never talked to a single one who didn't report having "fun," even those who use one for some serious purpose such as aerial photography. Air Cam opens the door to flying you might never try in another aircraft and with foresightful planning, good maintenance, and accommodating weather, you can enjoy an Air Cam in ways that are simply unrivaled. After the National Geographic Society commissioned designer Phil Lockwood in 1994 to create an aircraft to allow photographer Nick Nichols to fly over the Ndoki rain forest in Namibia, Africa, the design has been widely marketed. Nearly 200 are flying around the USA and other countries. Selling points besides twin-engine safety are its slow stall (39 mph), low fuel burn (3.5 gph at 50 mph ... for both engines), and cruise from 50-100 mph. A kit with two Rotax 912 ULS engines will set you back over $100,000 but the smile it can create is nearly priceless. Two hundred horsepower produces stunning flight qualities even those 180-hp Cubalikes can't match. I took a wonderful trip to the Florida Keys in an experience documented in this article. 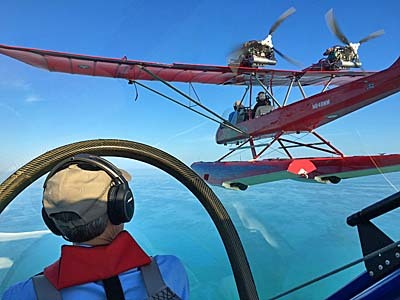 We flew a single engine LSA and it was great fun but we couldn't enjoy the island chain the way you can in an Air Cam, especially one on floats (photo). Recently the company, which often hosts fly-outs for its owners, visited Marathon Key not far from Key West. With those twin engines, and even better with floats, I'm guessing those pilots and passengers saw the islands in ways nearly no one else on the planet has ever experienced. That would make a wonderful Christmas present. What would you like for a Christmas present, perhaps if you won big in a lottery? Well, you’re a pilot so I might guess that some airplane has caught your fancy. Me, too. Like most pilots a number of desirable airplanes catch my eye but also like most pilots, I cannot afford to have one of each that appeals to me. High on my list of wished-for airplanes is Lockwood Aircraft‘s Air Cam. I have quite a few hours flying one example or another. I even earned my multiengine rating in one, as part of an article I wrote years ago. As part of the required hours of training to take the flight check — no written test is involved for a multiengine rating — I engaged an old friend and multiengine instructor, Richard Johnson. An Air Cam owner, Sebring dentist Ron Owen, graciously supplied his Air Cam. I've been on a couple AirCam outings and I have two points about them: (1) Owners of this unusual airplane are often fairly well-off people and see a golden opportunity when invited by the good planners at Lockwood Aircraft; and, (2) These pilots know how to have fun with their airplanes, flying to some delicious locations. Previous fly-outs included Jekyll Island, Heaven's Landing, Cedar Key off Florida's west coast, and the Bahamas. If you don't know AirCam here's a video that gives a bit of the flavor of this amazing aircraft. (I readily admit to a positive bias for the machine as I have had the chance to fly a good number of hours in it and earned my multi-engine rating in one ... but that's another story.) On the two occasions when I've joined the AirCam'ers on their fly-outs (or is that "fly-ins? "), I've discovered that these folks have uncovered some wonderful places. 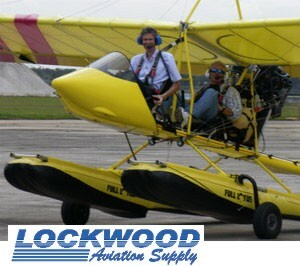 The Lockwood Aircraft folks, led by namesake designer Phil Lockwood, don't just hang out at the airport all day. 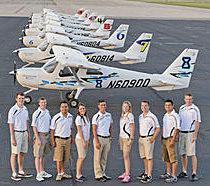 They aerial tour the location and then visit local restaurants and homes of AirCam friends. Everyone seems to enjoy themselves immensely and the people that buy, build, and fly AirCams tend to be some very interesting folks, in my opinion. With its two Rotax engines of one model or another, these airplanes are not the cheapest kits you can build, however, twin-engine flexibility and security offer enormous appeal. Owning one isn't in my budget nor possibly yours but a partnership could be a swell way to own one if you could make it work. No question, though, AirCam allows flying as you'll probably not do in any other aircraft I can envision. If you have any chance to fly in one, by all means, take it. I predict a long-lived smile following the experience. 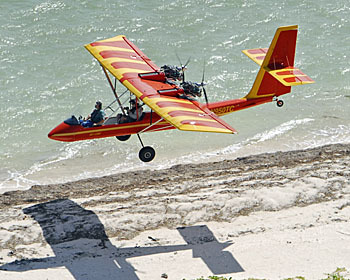 Next up for Team AirCam's fly-out itinerary is Marathon in the Florida Keys from Thursday to Sunday November 13-16, 2014. If you're an AirCam owner or are considering purchase of one, or just want to go hang out in a great, warm, beachside locale, contact the company and inquire (info at bottom). 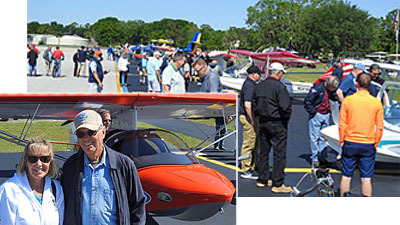 Demo flights are possible but limited.• Those wishing to fly as a group can follow the company team as they leave Lockwood's base at Sebring airport and fly over Everglades National Park shoreline with ocean crossing at Point Sable. If you do this in most aircraft you'll want altitude for safety; the AirCam'ers will see it much better down low. Once at Marathon, the resort atmosphere offers plenty of fun activities. You can also fly from Marathon around Key West as I did on a Fly/Drive vacation with some friends. 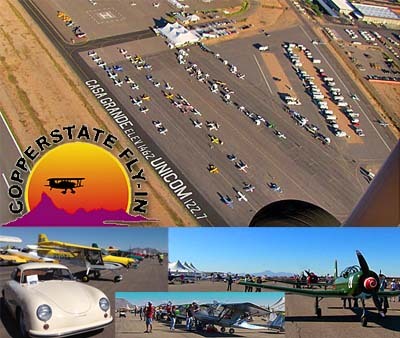 You don't have to go by AirCam; other airplanes are invited but contact Lockwood Aircraft. Or you can drive, which I'm told is also a good experience. If my history of joining the AirCam'ers is any indication, the hotel and restaurants they choose will be excellent. While we focus most coverage on Light-Sport Aircraft, light kits, and ultralights, we also have begun to expand our envelope by keeping up with LSA-like aircraft including four seaters from LSA providers. In this spirit, the twin engine AirCam is another good candidate. I have described the flying machine as "ultralight on steroids" because it has clear roots in ultralights such as the Drifter that Lockwood also produces even while it has become very sophisticated and very capable. The latter explains its existence. AirCam was originally commissioned for some very challenging flying in a National Geographic story about Africa where few good runways exist and near-endless jungle seems to reach out to snag an airplane in trouble. After the NatGeo effort, interest developed and has never stopped. Today, close to 200 AirCam kits have been delivered and Lockwood reports a thriving business. 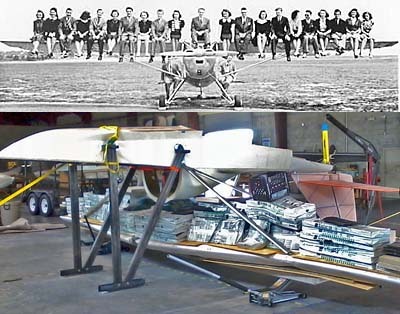 Following are AirCam Specifications: Gross Weight — 1,680 pounds (roughly that of a Cessna 150) Wing Span — 36 feet Overall Length — 27 feet Empty Weight — 1,040 pounds Stall Speed — 39 mph (it only looks too big for such a slow speed) Top Speed (Vne) — 110 mph Normal Cruise Speed Range — 50-100 mph Rate of Climb — 1,500 fpm (solo can see beyond 2,000 fpm) Single Engine Climb — 300 fpm (many twins cannot climb on one engine) Fuel & Range — 28 gallons and 340 miles at 70 mph Takeoff Roll — less than 200 feet Landing Roll — 300 feet Exhilaration Factor — off the charts • AirCam demo flight reservations must be made with Robert Meyer by November 6th. He advised, "These will be on a strict schedule and limited to those willing to sign a contract and give a deposit afterwards." If interested, email Robert or call 863-655-4242. I’ve been on a couple AirCam outings and I have two points about them: (1) Owners of this unusual airplane are often fairly well-off people and see a golden opportunity when invited by the good planners at Lockwood Aircraft; and, (2) These pilots know how to have fun with their airplanes, flying to some delicious locations. Previous fly-outs included Jekyll Island, Heaven’s Landing, Cedar Key off Florida’s west coast, and the Bahamas. If you don’t know AirCam here’s a video that gives a bit of the flavor of this amazing aircraft. (I readily admit to a positive bias for the machine as I have had the chance to fly a good number of hours in it and earned my multi-engine rating in one … but that’s another story.) On the two occasions when I’ve joined the AirCam’ers on their fly-outs (or is that “fly-ins?”), I’ve discovered that these folks have uncovered some wonderful places. The landscape around Heaven's Landing is beautiful but rather forbidding to low-level single engine flying. AirCam can loiter easily and can slow into the 35-knot range to allow full scenic absorption. See full AirCam specs. At one of the company-organized AirCam fly-ins, a collection of colorful and powerful twin engine aircraft gathered at Heaven's Landing, a beautiful airpark development in the Northeast Georgia mountains. Lockwood Aircraft has been working on a full enclosure canopy for AirCam; here you see the prototype. It can be removed in 30 minutes. 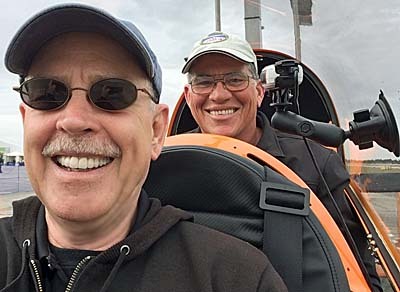 Phil Lockwood (front) and Robert Meyer (not shown) gave many sales demonstration flights and offered area rides to others in one of the very few airplanes that will allow flying, safely, at low levels over densely tree covered terrain. Company fly-ins are surprisingly rare despite offering a useful tool to propel new sales, to stimulate interest and camaraderie among existing owners, and to invigorate enjoyment of flying machines. This message became more obvious as a number of people joined a group of AirCam owners at Heaven's Landing, an airpark in northeast Georgia that is surrounded by hundreds of acres of densely forested nature managed by the U.S. Forest Service. Mountains rise to 3,000 feet above sea level and form an undulating landscape of tree-covered slopes. Such an area is perfect for an aircraft like AirCam that so excels in low-level flying. Indeed, I cannot think of another aircraft I would willingly fly over terrain where landing areas are so sparse. For those who do not know, AirCam is essentially a grown-up ultralight with twin pusher engines that can easily climb — even take off! — on only one of its two powerful engines. At 1,680 pounds and with two Rotax 912 engines producing 200 horsepower, AirCam is so potent that it can ascend at 2,000 feet per minute at full thrust and can still climb nearly 500 fpm with one engine idled. As one owner explained, AirCam operates at roughly the gross weight of a Piper Cub, which once flew with only 65 horsepower. In another comparison, AirCam is barely heavier than a Cessna 152, which has half the horsepower. 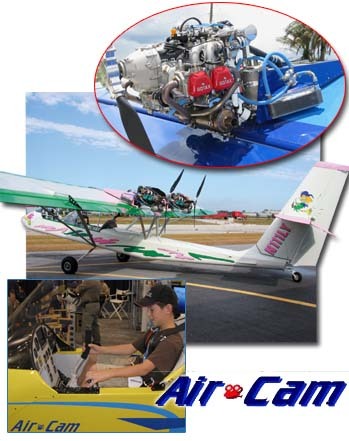 AirCam is produced by Lockwood Aircraft, one of several companies that share the last name of principal Phil Lockwood, a man known widely for his airshow seminars that demonstrate his encyclopedic knowledge of powerplants especially the Rotax line and particularly the 9-series. As he operates the largest service center for the Austrian engines, Phil has often been involved in the manufacturer's investigations of new engine models, lubrication products, service techniques, and more. His steady pursuit of knowledge for the 9-series engines has made him a leading global expert who is highly sought-after for his mastery of the subject. Of course, regular readers will recognize that with its twin engines and higher weight, AirCam is not a Light-Sport Aircraft. Indeed, it can only be bought as an Amateur-Built kit and you'll need at least a Private Pilot certificate with multiengine rating to fly one. Before FAA changed their mind (they reportedly will no longer grant an ME rating flying only in AirCam), I was able to earn my multiengine rating in an AirCam including taking the check ride. It must be one of the very easiest multiengine aircraft in all of aviation; the unlikely loss of an engine is so easily managed and the airplane performs so well on a single engine that winning the ME rating in one is almost cheating. However, this makes the flying machine highly enjoyable and inspires a great sense of safety. 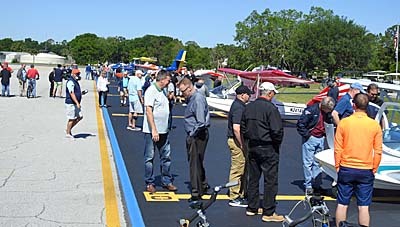 About a dozen AirCam owners flew in for the Heaven's Landing event include three from Florida, about a six-hour flight. As I assisted the company prepare for a new video, I interviewed owners and others who had just taken an AirCam flight. In my regular video taped conversations with pilots I often have to remind them to smile and show their enjoyment. While I understand many folks get nervous with a camera trained on them, the AirCam'ers appeared naturally motivated; everyone smiled often and especially when asked how they enjoyed the flight or their ownership. Their enthusiasm is infectious which probably explains one reason why Lockwood Aircraft can host a succession of AirCam fly-ins that are well attended. You can get some sense of their enjoyment by watching a company video. If you've not seen one of these productions I encourage you to check them out. AirCam videos are polished and professional efforts with flying scenes you won't see from other companies. 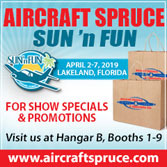 Go to their website for a taste or find the company's exhibit at airshows where they regularly have a large screen looping a BluRay DVD. Company pilots Phil and sales director Robert Meyer flew prospective customers and others all day long for two days, logging enough such flights to wear out most pilots. It was worth it, though, as they gained a couple solid sales and stimulated interest from others that may decide later. The location of Heaven's Landing gave Phil and Robert an excellent venue to show AirCam as one of the very few airplanes that will allow flying, safely, at low levels over densely tree covered terrain. 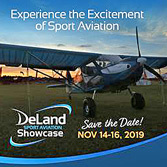 If you love sport flying and you've never considered an AirCam — which can be built for $130-150,000 — you might want to attend an AirCam fly-in and sample this special machine. AirCam is a kit that sells for more than $100,000 with engines (that are worth around half the total) but it is singular in its capabilities and the company is so respected for its quality and service that Robert reported selling 16 AirCam kits in the last nine weeks. Any company would love to match such a performance. More than 150 AirCams are flying and the demand is such that used, finished examples command near-retail prices that show how well they retain their value. Take a run down the line of AirCam assembled at Heaven's Landing in this video. 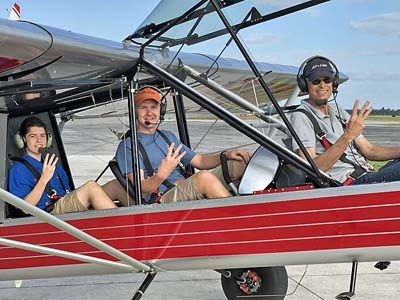 Company fly-ins are surprisingly rare despite offering a useful tool to propel new sales, to stimulate interest and camaraderie among existing owners, and to invigorate enjoyment of flying machines. This message became more obvious as a number of people joined a group of AirCam owners at Heaven’s Landing, an airpark in northeast Georgia that is surrounded by hundreds of acres of densely forested nature managed by the U.S. Forest Service. Mountains rise to 3,000 feet above sea level and form an undulating landscape of tree-covered slopes. Such an area is perfect for an aircraft like AirCam that so excels in low-level flying. Indeed, I cannot think of another aircraft I would willingly fly over terrain where landing areas are so sparse. For those who do not know, AirCam is essentially a grown-up ultralight with twin pusher engines that can easily climb — even take off! — on only one of its two powerful engines. Things can change and yet stay the same. You can comprehend this paradox by considering the tandem 2-seat Drifter. Drifter production is under new management by someone many regard as a "rightful owner." Yet the basic flying qualities of the Drifter design are basically unchanged. As 2007 started, Phil Lockwood again has all rights to the Drifter as part of a design, tooling, and inventory deal that rescued the Drifter and 2-seat twin-engine Air Cam from an uncertain future with investor Antonio Leza, who ran the operation for a few years. Lockwood is associated with the Drifter due to his many years of work with the design. He once worked for Maxair proprietor Denny Franklin who pioneered this enduring shape. In the rough and tumble days of early ultralights, Franklin lost control of Drifter ownership and for a time the design wandered. More correctly, the new owners failed to take the Drifter forward and instead merely exploited its popularity. Fortunately the airplane persevered. The Drifter ended up in production by Leza, or Leza-Lockwood as the Sebring company was first known. FOUR-STROKE POWER - The Drifter on straight floats performs beautifully with the 81-hp Rotax 912. Though it adds weight, Lockwood's team has done a great installation of the 4-stroke powerplant. Now as Lockwood resumes control of the Drifter and Air Cam, Franklin remains a major part of the new operation. So while things have changed dramatically for the Drifter over the years, the airplane continues to fly well and to give enjoyment to those who own them. And it now appears once again in a highly stable ownership situation. 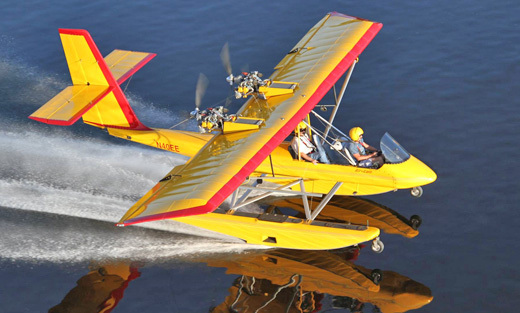 One of our airborne photos captured Jeff Hudson's amphibious Full Lotus float-equipped Drifter that has 4,000 hours of airframe time accumulated over the past 11 years. Another photo shows a straight Full Lotus float Drifter in Tony and Adriel Anderson's Miami operation that has 5,000 hours on it. And a Cancun, Mexico, banner-towing operation run by Luis Barocio helped one Drifter amass a remarkable 10,000 hours of service. Such stories are not uncommon, proving the statement, "Drifters work!" 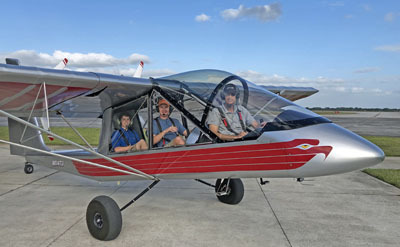 Drifter Renewal Clearly prized for its ability to deliver training flights, the Super Drifter 912 shows refinement and features that make it an advanced-generation ultralight worthy of moving forward in the age of light sport aircraft (LSA). How is this Drifter 912 different from the Drifter flown in the late 1990s? According to Franklin the new 912-powered version is a significant redesign of the earlier models. Numerous changes were required to allow fitting the heavier Rotax 912 situated at the rear of the wing. CELBRITY DRIFTER PILOT - On a lovely winter day in Miami, Latin singer Enrique Iglesias (son of Julio) takes a photographer aloft. When not performing or composing, the younger Iglesias enjoys flying a Drifter on floats with support from Ultralight Adventures. An extended boom tube and fuselage pan positions the front seat 5 inches further forward to better offset the weight of the 912. It also cures a light nose associated with the first 912-powered Drifters. Franklin said, "The entire fuselage was beefed up to accommodate the higher weight of the 912." The changes include sleeving to better brace the main boom, which remains the same diameter. Landing gear legs were also beefed up. All this extra metal does boost the weight a few pounds, he admitted. Despite the strengthened airframe, a 912-powered Drifter is much lighter than common LSA. An empty Drifter comes in under 500 pounds compared to many LSA that weigh more than 800 pounds. Any experienced pilot will tell you that the lighter plane will handle, take off, and land much differently. The Drifter can deal with the extra pounds because it has larger wings. The Super Drifter has 10 square feet more wing than the 2-stroke powered Drifters. The extra wing area comes from a wider aileron. When the chord went from 8 to 12 inches, it added 4 inches across the entire span. Ailerons were shortened spanwise to allow flaps. Lockwood's 912-powered Drifter also is the only model that comes standard with flaps (though you can order a flap kit for a Rotax 582 Drifter). This heavier Drifter (compared to, say, a Rotax 503 version) has hydraulic brakes and aircraft tires just like the more expensive LSA. Flaps are standard on the Drifter 912. "It also has complete instrumentation and a stainless steel exhaust for the 912 engine," adds Franklin. And, as with all Rotax 912 engines, electric starting is standard gear. 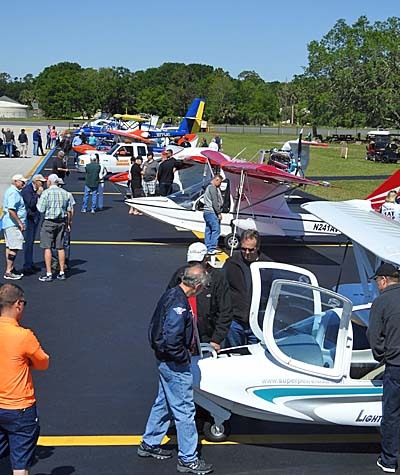 Franklin also referred to a new, wider tailwheel that works better in places with sandy soil as is found throughout Central Florida. During the Drifter's "drifting years," Lockwood kept customer support alive. He also developed flaps for the Drifter, not as an employee of the manufacturer but as Lockwood Supply. While creating flaps to assist floatplane operators, Lockwood also made subtle changes in the airfoil. "We tried many different shapes," Lockwood recalls and finally came up with a unique airfoil featuring undercamber. It worked well enough that the same airfoil was used on the Air Cam. Even though Lockwood was keeping the Drifter alive with his developments, others tried to "improve" the aircraft while the Drifter design struggled in the very late 1980s. 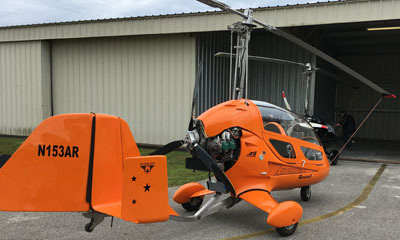 An Australian company, Tiger Aviation, tried struts instead of cable bracing in an attempt to interest general aviation pilots. With various other additions intended to make it appeal to the Cessna set, their Drifter SB got heavy and flew like a truck. Tiger Aviation's Drifter SB had a much higher windscreen; again for the general aviation pilots the Aussies hoped to attract, but the nose pod of the Lockwood Drifter 912 is fuller on the sides, reducing windblast to the rear seat. The American reintroduction of the Drifter has a lower windscreen than the Down-Under version. HIGHLY EXPERIENCED - After the Sebring 2007 LSA Expo, Phil Lockwood (front seat) went aloft with Jeff Hudson, who, despite being a long-time Drifter instructor, appears relaxed and along for a pleasure flight in this case. 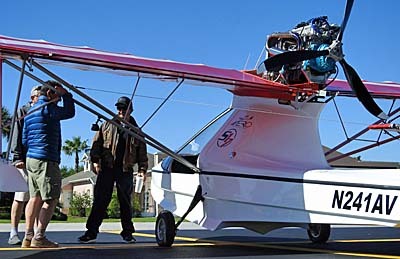 Lockwood's 81-hp Rotax 912 Super Drifter 912 is nearly 100 pounds lighter than the strut-braced version and flies with more agility. Bracing cables may strike some pilots as old-fashioned, but viewed aloft they become almost invisible while struts stand out obviously. If you can see them, so can the wind. Cables also add more rigidity all around which, Phil notes, tends to make the tail more effective via wires connecting boom to wings. Proven by waterborne use by Hudson, the Andersons and Barocio, the Drifter 912 comes set up so you can add regular or amphibious floats. An engineered location for the rearward float attachment is found near the engine downtube supports. Why We Fly Ultralights I've been fortunate to fly with all of these folks except Barocio (you are required to have a Mexican Commercial license to fly in Cancun). 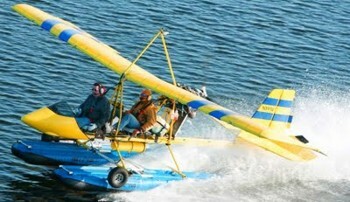 Each has become highly experienced in flying a Drifter from water. Still another Florida pilot checked me out in the Drifter 912. 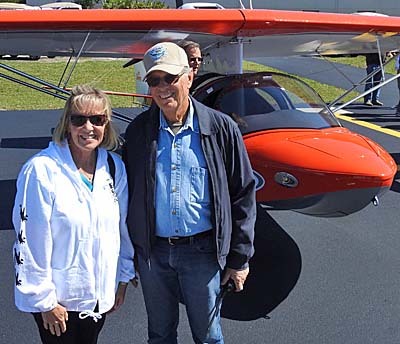 An old friend from hang gliding days, Richard Johnson is a pioneering aviator in the Sunshine State. A former professional water-skier and businessman, he and a Japanese partner have been selling water-skiing goods to Japan. 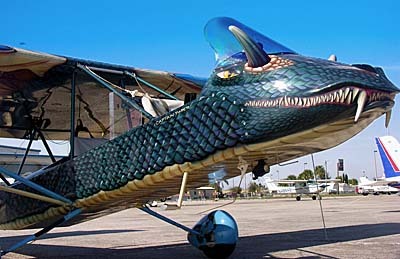 Johnson has accumulated almost every FAA rating in the books and has flown several of Fantasy of Flight's most unusual aircraft. His logbook is full of entries for aircraft most pilots have never even seen. After familiarizing me with the Super Drifter 912's cockpit, Johnson yielded the front seat to me and hopped in the rear. I didn't require much encouragement to return to a seat with one of the best views in all of aviation. It has been called "flying on the front of a pole." With the wings behind you, some pilots feel deprived of an aircraft reference. I loved it, as will most experienced ultralight pilots. Entry to the front has some challenge mainly because no step was fitted to help. Instead, I followed Johnson's technique, which involves starting on the left main tire and swinging your left foot up to the sturdy floor pan of the Drifter. During this entry process, I found it handy to use the trio of support tubes aft of the seat; they offered a firm and sure brace while I slipped into the seat. The flap lever offered three positions beyond neutral and Johnson suggested the use of one notch for takeoff. When you use full flaps for landing you get a significant nose-down attitude. 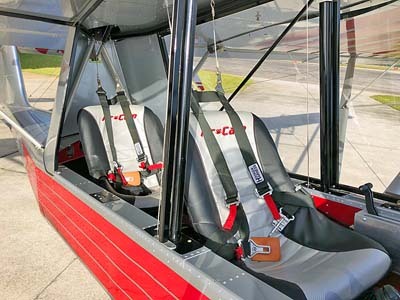 The Drifter uses 4-point seat belts, which help people feel comfortable in this out-in-front-of-everything airplane. One drawback of such secure restraints is that I could not reach the switches on the instrument panel with the shoulder belts fully tightened. Since the seats don't adjust, the distance to the pedals and joystick cannot be varied once the kit is constructed. READY TO TEACH - Posing in the afternoon sun at Miami instructor Tony Anderson's home base, this Super Drifter 912 is clean and ready for students. Note the instruments installed at the rear seat, plus the BRS emergency parachute and storage compartment under the floor pan. Johnson reported visibility from the rear was better than many tandems he's flown, certainly the enclosed ones. After twisting the key to fire up the 912, we taxied for takeoff. I was again reminded of the immensely wide view. Taxiing the Drifter is like riding a motorcycle; you can see everything. Ups and Downs Launching the 81-hp Super Drifter 912 is an exciting affair. Thanks to the stunning thrust of the 3-blade Rotax 912, I found it unnecessary to use full throttle for takeoff even with two persons on board. We probably weren't quite at full gross but Johnson and I only required 5,000 rpm to lift off easily. Airport neighbors like the muted noise. After maneuvering around the practice area for a while, we headed back to South Lakeland Airpark for some touch and goes. I rapidly found it was easy to make landing approaches at 40 mph, speeding up slightly as we neared the ground in order to assure sufficient flare energy. With the powerful 912 engine, the Drifter's slow-speed behavior assures you can get into some pretty small fields. Flaps come standard on the 912 model, yet Johnson demonstrated a fairly steep slip, which showed that the Drifter can perform this maneuver well even though it has limited fuselage side. Slips and flaps give great approach path control. Despite the Super Drifter 912's overall ease of operation, I experienced some challenge to make smooth landings because I simply did not want to lower the nose as much as was needed. This may be an effect of sitting forward of most portions of the aircraft structure and is something for which non-Drifter pilots need to be aware. When Johnson demonstrated a single main wheel touchdown, it felt like we were going to stick the nose in the ground. (We didn't.) Based on Johnson's exquisite one-wheel landing during which he used a little bit of power to facilitate the maneuver, I concluded that a bump of the throttle on the landing touchdown would help new Drifter pilots (and some flight reporters) make smooth landings. 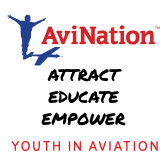 SEAT AVAILABLE - Adriel Anderson has flown some 5,000 hours on a single Drifter (in addition to others), making him a great resource for students taking instruction. Their Website has a great video of a Drifter flying in Miami. Easy to Handle Overall, the Super Drifter 912's handling is reasonably light to the touch and responsive enough for most pilots. No one would call the roll rate fast but for training and many other recreational flights, the Drifter's roll rate will prove to be just about right. I was quickly able to do Dutch rolls that were well coordinated but not to very steep angles. Pitch forces are light enough that you'll never miss a trim control. The Super Drifter, despite more weight, handles well. The larger, more refined wing is part of the reason, but the move to flaps and ailerons was another contributor. Two-stroke Drifters have full-span ailerons where the Super Drifter has its aileron surface at the tips. Since this is where most work is done and given their larger size, the Super Drifter retains much of the same control feel as its lighter siblings. I did manage to discover that during takeoff, use of all 81 horsepower could cause you to run short of right rudder range. This may require some adjustment to a fixed rudder trim to dampen the 912's power, but based on my experience, I can scarcely imagine a situation where you might actually need to add full power to launch unless you were operating at very high elevations. As Lockwood observes, "You can use full power and control it, but you need to lead with the rudder." Like most transitioning pilots I was slow in rudder application so I had to back off the power to regain yaw control. And though a couple of 100-hp Drifters have been assembled, Lockwood agrees that 81 horses are more than needed. Even an amphibian Drifter at full gross performs strongly with the less powerful Rotax 912 engine. 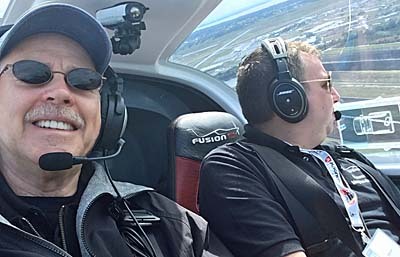 Johnson and I cruised around Central Florida enjoying a fine day of flying at a leisurely 70 mph. For me, this is plenty of speed. The Super Drifter 912 may have buckets of extra power, but still flies like an ultralight. Even with the big engine, Lockwood has set the never-exceed speed at 85 mph. The design was never meant to be a speedster. The Drifter 912 exhibited a surprisingly good sink rate, especially for an ultralight of this weight and size. The day was full of thermals, but I was able to factor out the lift to record a sink rate less than 400 fpm in a couple of long descents, an excellent figure. In a related test of performance it appeared that only 4,000 to 4,100 rpm was needed to sustain altitude. The cylinder head temperature ran so cool (120°) that I began to wonder if the gauge was even working. I was assured this was normal. Flying low over the fields we were able to sustain airspeeds as slow as 45 mph, which dropped below 40 mph by using full flaps. Many aircraft that add the Rotax 912 and are flown with two occupants can't explore this enjoyable realm of ultralight flying. I don't believe I've ever heard anyone criticizing the stability of the Drifter series. My investigations have always found the design very predictable. Of course, I generally don't do radical maneuvers. Using normal attitudes and some aggressive control inputs, I found the Super Drifter 912 maintains its good behavior. Only some burbling at the prop and some stick shaking revealed power-on stalls, but none of my trials saw the nose break. I found only a modest break when performing power-off stalls. Accelerated stalls done to the left merely dropped the right wing and straightened out. Accelerated stalls to the right acted like a power-on stall, resisting without breaking over. You can get in trouble with any airplane, but the Drifter will be more forgiving than many. Flying and Buying The Super Drifter 912 is similar to many ultralight trainers that made the exemption weight: in the future it will probably have to be a kit-built aircraft licensed Experimental Amateur-Built. That means some with a Sport Pilot certificate or better can take a friend and fly all over the country. But you will not be able to train for hire nor rent a Drifter after January 31, 2010, and that long only if you register an ultralight exemption trainer as an Experimental light sport aircraft (ELSA) by January 31, 2008. Lockwood and his team have not determined if they will pursue SLSA status. "We're not looking at that at this time," says Lockwood. "But we have seen plenty of interest in the kit-built model." Plus, those operating in active schools can easily get enough value out of a Super Drifter 912 operated under the 2-seat training exemption through January 2010. 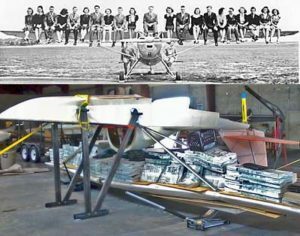 At that time, the school could sell the plane to a student, likely recovering most of their investment. "A well maintained Drifter holds its value quite well," reports Lockwood. Buying a Rotax 912-powered Super Drifter is remarkably well priced at $32,575 for the aircraft and engine. Compared to many light sport aircraft that use this same engine but are priced about three times as high, the Super Drifter 912 is quite a value in a very well proven design. The Rotax 912 can go 1,500 hours before an overhaul. It sips fuel quite slowly for its 81 horses of power. It runs quieter and introduces less vibration than a 2-stroke engine, and the airframe has been engineered to handle the big power. Still, $35,000 (with instruments and selected accessories) may seem expensive to ultralight pilots spoiled on $15,000 Quicksilvers. That's the price of 4-stroke power. A Rotax 503-powered Drifter that costs less is also a whopping 110 pounds lighter (385 pounds empty), which further improves handling and sink rate performance. You won't climb as fast with two on board (about 500 fpm with the 50-horse 503), but 2-seaters are often flown solo and a Rotax 503 is plenty of power for single-place operations. Maxair founder Denny Franklin pioneered the Drifter many years ago, at first with a tiny little Rotax 277 (which worked great, by the way) after a few initial Drifters were built with 35-hp Kawasaki 440 engines. By comparison, a Super Drifter 912 seems massively overpowered, but the design remains a workhorse with excellent beginner flight characteristics. 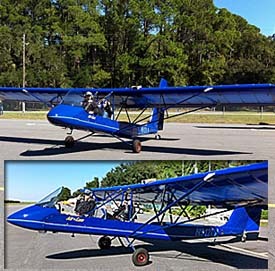 If you run a flight school and need a dependable ultralight to work hard for you until the January 31, 2010 deadline, a Super Drifter 912 may be the perfect choice. Or, if you're merely a pilot who wants to have a little fun flying in a dependable machine for a reasonable price, the Super Drifter 912 deserves another look, especially now that Phil Lockwood is again running the show. 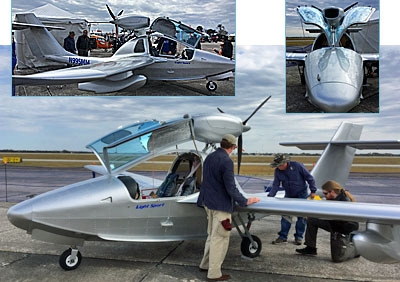 Standard Features Rotax 912, electric starting, all stainless exhaust, flaps, ASI, altimeter, CHT, oil pressure, oil temp, Hobbs meter, tachometer, dual controls, nose fairing, dual 5-gallon fuel tanks, wide aluminum wheels, aircraft tires, hydraulic brakes, 3-blade Warp Drive propeller. Options Straight or amphibious floats, ballistic parachute system, other props and prop leading edge treatment. Construction Aluminum airframe, spring steel landing gear, presewn Dacron® wing coverings, fiberglass nose fairing. Made in the USA. Pros - Ownership of the Drifter is back in familiar hands (see article). In light sport aircraft (LSA) age, the Super Drifter 912 adds 4-stroke value without affecting the basics of this ultralight design. More than 1,000 Drifters reported flying. Design retained cable bracing; lighter weight and greater rigidity than struts. 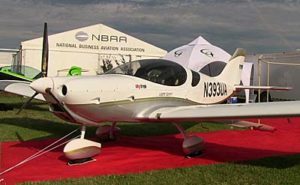 Cons - Pilots interested in LSA may not like sitting on the end of a boom, though ultralight enthusiasts probably love it. Some pilots will regard the Drifter as a dated, older design. Must be assembled from a kit, which complicates resale and adds owner liability. Pros - The Drifter has always offered effective flaps; easy to deploy with lever alongside pilot's thigh and comfortably reached. The Drifter 912 is well equipped (though 4-stroke engine adds considerably to cost). Stick-mounted, mini-hydraulic brake system is quite powerful. Engine access is excellent, no cowl. 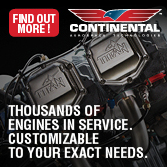 Cons - Since the Drifter can fly two people with a 50-hp Rotax 503, the 912 seems much more engine than needed. No instruments installed for the rear-seat instructor, but you can carry any system you can afford; allowed when amateur building. Pros - If you like wide-open visibility, the Drifter is a great choice. Four-point seat belts front and rear, especially appreciated in such a boom-and-floor pan construction. Adequate instrument panel with T-panel suffices for ultralight flying. Entry is reasonable, especially to the aft seat where other tandems are difficult. Cons - Some pilots do not like the openness of a Drifter and when flown solo from the front, structure around you won't help acclimate. Entry to the front around the wider pod requires a technique. Rear-seat occupant is subject to considerable wind buffet. Seats do not adjust in flight. Pros - Superb visibility from the front seat to spot traffic. Hydraulic brakes were quite powerful on land version. Spring steel gear offered good shock absorption even with the heavier 912 engine and two occupants. Good ground clearance. Prop well protected by floor pan. Cons - Land version is a taildragger and therefore not for everyone. 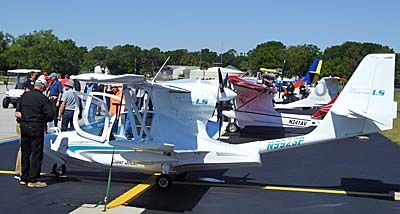 The tailwheel was rather small on Florida's sandy soil (though a larger tailwheel is optional). Suspension is limited to gear leg flex and tire inflation. No differential brakes, though they're hardly needed. Pros - The Drifter visibility is unparalleled in aviation. Low landing approach speeds (40 mph) allows entry to small fields or lakes. Flaps are highly efficient and easily deployed. Slips proved surprisingly effective given the small side area. Short ground roll with the Rotax 912. Cons - The Drifter 912 is ultralight like and can dissipate energy in ground effect; this requires better flare timing and technique (though the Drifter lands very short). No other negatives. 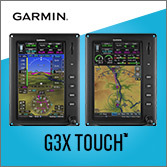 Pros - While not fast, controls offer plenty of authority for crosswind operations. Response rate is about perfect for training flights. Controls were well rigged and had reasonable pressures. Steep turns went well as the Drifter holds the turn with little input. Precision turns are easy, too. Cons - The Drifter 912 does not have a fast roll rate (though good authority); Dutch rolls worked well only to shallow angles. Full power on takeoff can cause you to run out of rudder range to counteract it. Lack of visual references in the front seat takes some acclimatization. Pros - More powerful Rotax 912 yields better fuel economy than the lower powered Rotax 582. Climb is breathtaking. Robust airframe has survived challenging duties in many locations. Design has long proven itself on floats. Low-over-the-field flying goes well with flaps deployed. Sink rate is excellent. Cons - By design the Drifter is not a speedster (an open-cockpit wouldn't be very comfortable at fast speeds), so the big 912 engine only adds to climb and takeoff distance performance. Plus, powerful engines cost significantly more; a Rotax 912 costs three times as much as a Rotax 582. Pros - Power-off stalls broke but very predictably with fast, almost automatic recovery. Power-on stalls only discernible by a tail buffet. Accelerated stalls often dropped the high wing and leveled out quickly. Longitudinal recovery from level flight was fast and straightforward, no doubt due partly to a long coupled tail with large area. Cons - Drifters have long been fitted with emergency parachutes. Typical high thrust line response lowers nose pronouncedly on power addition (opposite of most certified aircraft). Deck angle gets extremely steep in full-power stall practice. No other negatives. Pros - In a LSA world full of Rotax 912 engines, the Super Drifter 912 fits in well using this reliable 4-stroke Rotax 912 powerplant. Strong, durable airframe that has done heavy duty for years; several Drifters have thousands of hours and at least one more than 10,000. Highly recognized design; helps resale values. Cons - The Drifter 912 is much more expensive than a 2-stroke-powered model (though those are still available). If you sell your Drifter it may take somewhat longer than a more conventional, enclosed aircraft (though a good following will help sell any well-maintained examples). Things can change and yet stay the same. You can comprehend this paradox by considering the tandem 2-seat Drifter. Drifter production is under new management by someone many regard as a “rightful owner.” Yet the basic flying qualities of the Drifter design are basically unchanged. As 2007 started, Phil Lockwood again has all rights to the Drifter as part of a design, tooling, and inventory deal that rescued the Drifter and 2-seat twin-engine Air Cam from an uncertain future with investor Antonio Leza, who ran the operation for a few years. Lockwood is associated with the Drifter due to his many years of work with the design. He once worked for Maxair proprietor Denny Franklin who pioneered this enduring shape. In the rough and tumble days of early ultralights, Franklin lost control of Drifter ownership and for a time the design wandered. More correctly, the new owners failed to take the Drifter forward and instead merely exploited its popularity. Fall at Jekyll Island was much better for Air-Cam N912LA than spring at Sun 'n Fun, where a Tornado turned the twin-engine aircraft into a pile of tubes and fabric. My good friend and Air-Cam developer, Phil Lockwood, likes to hold fly-outs for his customers. 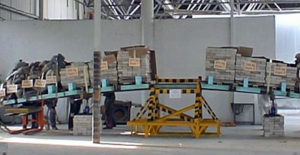 More than 160 kits have been delivered and built; each fly-out has attracted several of these owners. Phil and his Lockwood Aircraft associate George Weber have invited me several times but I've had to miss earlier gatherings for owners of this iconic "twin engined ultralight" (it isn't really an ultralight but has its roots in that category). For once I got to attend. The destination was the beautiful Jekyll Island resort area of Georgia; it's near St. Simons Island, another popular vacation destination. *** On a stunningly beautiful day, I was privileged to take my wife and two friends aloft for 30-minute tours of the Island. This was great fun for all. But what made it especially interesting is that I did this in N912LA, one of three Air-Cams badly trashed by the tornado at Sun 'n Fun 2011 (photo). In an effort typical of the hard-working staff at Lockwood Aircraft, this and two other Air-Cams were returned to flight after looking like a crumpled pile of tubing and fabric. 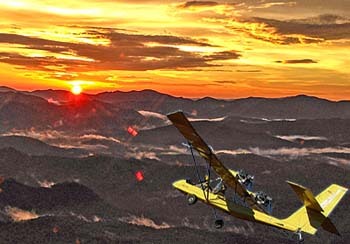 *** The Air-Cam is neither ultralight nor Light-Sport Aircraft but it acts like either one in some ways. For touring an idyllic setting like Jekyll Island, Air-Cam allows what you would be unlikely to do in any other airplane with which I'm familiar. Air-Cam, in which I obtained my multi-engine rating, flies so well on a single engine that you can fly low over marsh lands or stray over the ocean in near-certain safety. I have successfully taken off (solo) in Air-Cam with one engine at idle thrust; this is something you never consider trying in other twin-engine aircraft. If you lose an engine in flight at almost any attitude or altitude you can barely discern you've lost an engine, far different from the workout most twin-engine aircraft will give you after an engine quits. *** Air-Cam is so confidence inspiring at 50-200 feet off the surface that such becomes the standard cruising altitude on site-seeing missions as we flew over Jekyll. We literally had to climb to cross bridges, to allow the safe altitude mandated by FAA while flying above people on the surface. We also climbed to enter pattern altitude... yes, climbed. These amazing flight capabilities are backed by Lockwood's legendary maintenance. I've known Phil for decades and if he says an airplane is right, I ask no more questions. His word is gospel in matters of maintenance. *** Not only was the flying experience wonderful, we discovered those Air-Cam'ers really know how to pick excellent destinations. We stayed in the Jekyll Island Club hotel, an early 1900s facility kept in marvelous repair. It was pricey but worth the money. Twice we dined at hotel restaurants for some of the tastiest food any of us has enjoyed. My good friend and Air-Cam developer, Phil Lockwood, likes to hold fly-outs for his customers. More than 160 kits have been delivered and built; each fly-out has attracted several of these owners. Phil and his Lockwood Aircraft associate George Weber have invited me several times but I’ve had to miss earlier gatherings for owners of this iconic “twin engined ultralight” (it isn’t really an ultralight but has its roots in that category). For once I got to attend. The destination was the beautiful Jekyll Island resort area of Georgia; it’s near St. Simons Island, another popular vacation destination. *** On a stunningly beautiful day, I was privileged to take my wife and two friends aloft for 30-minute tours of the Island. This was great fun for all. But what made it especially interesting is that I did this in N912LA, one of three Air-Cams badly trashed by the tornado at Sun ‘n Fun 2011 (photo). Lockwood Aircraft‘s Super Drifter open-cockpit kitbuilt plane, the resurrection of the Drifter design that was the basic concept for Phil Lockwood’s AirCam twin-engine airplane, (a unique camera platform first created for National Geographic), is getting a new set of tailfeathers. *** I first flew a Hummer ultralight, designed by Klaus Hill, back in the fall of 1980 at Crested Butte, CO. It belonged to hang gliding pal Gil Kinzie. *** We were in CB for a soaring contest and he let several of us fly it, though most of us had no general aviation training. Ah, those wild and wooly days of free flight. *** As such, the Drifter was one of the very first viable ultralights and presented a unique flying feel to its pilots: you sat out on the end of a long fuselage keel tube with everything – wings, motor, wheels – behind you! *** Once you got over the initial floating-in-space challenges to your comfort zone, you fell in love with the incredibly open, free feeling. Read More About: Classic Drifter 912 Lockwood Aircraft Corp.
A future Air-Cam pilot tries out the open cockpit. The whimsical paint job is the work of owner Anita de Villegas. [Top] The Rotax 914 Turbo installation. Check Air-Cam specs. Air-Cam isn't a Light-Sport Aircraft because it has two engines. OK, it's also a shade heavy but if Air-Cam could, it would be a LSA. Certainly it's "light" and "sport" compared to most twins. Regardless, it's a favorite of all the airplanes I've flown so I'm pleased to see its rapid progress under the leadership of Phil Lockwood, the original developer. *** The latest accomplishment is a factory-authorized amphibious float system from Montana Floats that includes all mounting hardware. As though it needed any more power -- Air-Cam is the only multiengine airplane I've flown that can launch with one engine -- the twin pusher can now be equipped with two Rotax 914 Turbos. Combined with the extra power (230 hp total), Air-Cam can be fitted with a constant speed reverse pitch prop system ideal for float-equipped Air-Cams. A new rigid mount can now accommodate High Definition video cameras...it is, after all, the Air-CAM. They've also updated all the manuals, a big job that builders and owners will appreciate. 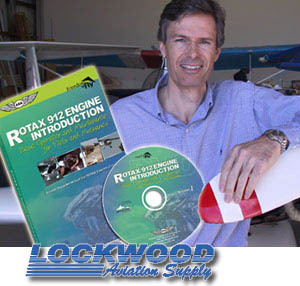 *** Lockwood Aircraft is finishing a new DVD and they have a factory Air-Cam for demo flying and testing. Projects to come include a BRS airframe parachute system and a full enclosure. Air-Cam isn’t a Light-Sport Aircraft because it has two engines. OK, it’s also a shade heavy but if Air-Cam could, it would be a LSA. Certainly it’s “light” and “sport” compared to most twins. Regardless, it’s a favorite of all the airplanes I’ve flown so I’m pleased to see its rapid progress under the leadership of Phil Lockwood, the original developer. *** The latest accomplishment is a factory-authorized amphibious float system from Montana Floats that includes all mounting hardware. As though it needed any more power — Air-Cam is the only multiengine airplane I’ve flown that can launch with one engine — the twin pusher can now be equipped with two Rotax 914 Turbos. Combined with the extra power (230 hp total), Air-Cam can be fitted with a constant speed reverse pitch prop system ideal for float-equipped Air-Cams. A new rigid mount can now accommodate High Definition video cameras…it is, after all, the Air-CAM. AirCam, Drifter… Dust Settles; We Have a Winner! 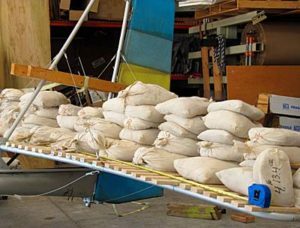 The Drifter, one of the most popular and rugged ultralights ever built, is now sure to continue its life under the direction of one-time Drifter marketing man, Phil Lockwood (nearly at the beginning of his career in light sport aviation). Among all airplanes I've flown the AirCam may be the most fascinating. This superlative twin-engine "ultralight" offers flying in a way few (or no) other airplanes can. (I earned my multi-engine rating in an AirCam.) Given my interest, I've followed the efforts by owner Antonio Leza to sell the operation. Over the last few years several would-be buyers came and went. No deal happened. Last fall I SPLOGged that Sebring businessman Shawn Okun appeared to have it sewn up. Again, no deal. *** But that's over now. The dust has settled and AirCam is headed back to someone I consider its "rightful owner:" Phil Lockwood. This time the sale is for real and includes all design rights, tooling, jigs, and inventory for the AirCam and Drifter. Phil has a long history with both designs; he knows each intimately. *** Phil and wife Tish have worked hard to build an expanding enterpise at Sebring. Recently, they added building space and one area set aside for growth will now be filled with AirCam and Drifter components. Phil reported, "A LOT of inventory is included." No production plans have been announced yet. Phil clarified, "We won't have time to work on this until after AirVenture Oshkosh," so it will be August before further announcements can be made. Meanwhile...Welcome home, AirCam and Drifter! Among all airplanes I’ve flown the AirCam may be the most fascinating. This superlative twin-engine “ultralight” offers flying in a way few (or no) other airplanes can. (I earned my multi-engine rating in an AirCam.) Given my interest, I’ve followed the efforts by owner Antonio Leza to sell the operation. Over the last few years several would-be buyers came and went. No deal happened. Last fall I SPLOGged that Sebring businessman Shawn Okun appeared to have it sewn up. Again, no deal. *** But that’s over now. The dust has settled and AirCam is headed back to someone I consider its “rightful owner:” Phil Lockwood. This time the sale is for real and includes all design rights, tooling, jigs, and inventory for the AirCam and Drifter. Phil has a long history with both designs; he knows each intimately. *** Phil and wife Tish have worked hard to build an expanding enterpise at Sebring. Rotax Aircraft Engines power 87% of the SLSA fleet (by model count, not units sold). Of the top-selling 20 SLSA companies, only 4 (Legend, CubCrafters, Jabiru, and IndUS) use a non-Rotax brand for 23% of sales. Phil Lockwood stars on ASA's Rotax 912 DVD by Paul Hamilton. 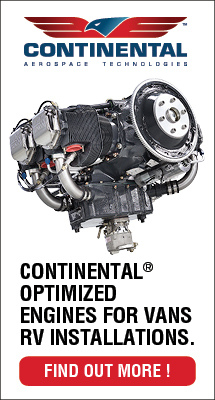 A&P acceptance (or lack thereof) is a leading reason for Cessna's decision to use the Continental O-200D in Skycatcher. Surveys through their Cessna Pilot Centers showed that a majority of FAA-licensed mechanics preferred an engine they already know. Most lack knowledge of the Rotax 9-series that powers the majority of the LSA fleet. And when an expert knows little about a new product, human nature compels him to resist. 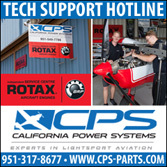 *** Trying to educate A&Ps on the best-selling LSA engine is one task of Rotax service center operator, Phil Lockwood. This winter, he'll be giving hourlong presentations for A&Ps (and owners), trying to encourage to A&Ps to take a pair of two-day courses to bring them up to speed with the Austrian engines. *** Of 62 presently approved SLSA models, only 8 (13%) use another engine (Continental or Jabiru). Starting in 1973 with the ultralight market, Rotax has produced more than 125,000 aircraft engines. The parent company behind Rotax Aircraft Engines produces 200,000 engines annually for personal watercraft, all-terrain vehicles, snowmobiles, motorcycles, and karts as well as aircraft. Of this production, 70% are four stroke. 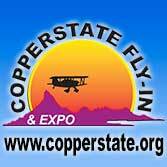 Hear Phil's FAA talk...or Sebring Expo talk. A&P acceptance (or lack thereof) is a leading reason for Cessna’s decision to use the Continental O-200D in Skycatcher. Surveys through their Cessna Pilot Centers showed that a majority of FAA-licensed mechanics preferred an engine they already know. Most lack knowledge of the Rotax 9-series that powers the majority of the LSA fleet. And when an expert knows little about a new product, human nature compels him to resist. *** Trying to educate A&Ps on the best-selling LSA engine is one task of Rotax service center operator, Phil Lockwood. This winter, he’ll be giving hourlong presentations for A&Ps (and owners), trying to encourage to A&Ps to take a pair of two-day courses to bring them up to speed with the Austrian engines. *** Of 62 presently approved SLSA models, only 8 (13%) use another engine (Continental or Jabiru). Starting in 1973 with the ultralight market, Rotax has produced more than 125,000 aircraft engines. 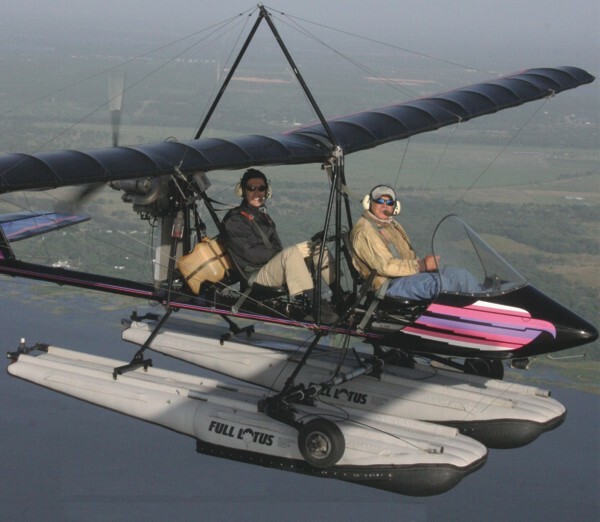 Though busy with his expanding enterprises, Phil goes aloft with Drifter guru Jeff Hudson (aft seat) to flight check a Drifter 912 on amphibious Lotus floats. Read my Super Drifter 912 report. When I first met Phil Lockwood, he was selling Drifters. That was more than 20 years ago. 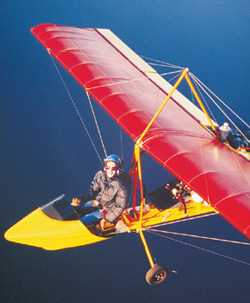 In that time the venerable Drifter ultralight went through several owners and many changes. A Drifter model even hailed from Australia for a time. But in a combined deal including the Air Cam -- which Phil designed -- all design rights, inventory, tooling, documentation returned home...to Lockwood enterprises (Read July 5, 2006 SPLOG). A 7,000 square-foot addition enlarges Lockwood's facility to house the new activity. On a tour of this facility after the Sebring Expo I saw the stockpile of components that demanded a new building. Initially Phil expected only to supply Drifter parts to service about 1,000 aircraft flying around the globe. But early demand has staffers shipping a few kits even while they complete the factory. Lockwood also plans to deliver full Air Cam kits bringing this hugely delightful aircraft back to regular production. Welcome back, Drifter and Air Cam! When I first met Phil Lockwood, he was selling Drifters. That was more than 20 years ago. In that time the venerable Drifter ultralight went through several owners and many changes. A Drifter model even hailed from Australia for a time. But in a combined deal including the Air Cam — which Phil designed — all design rights, inventory, tooling, documentation returned home…to Lockwood enterprises (Read July 5, 2006 SPLOG). A 7,000 square-foot addition enlarges Lockwood’s facility to house the new activity. On a tour of this facility after the Sebring Expo I saw the stockpile of components that demanded a new building. Initially Phil expected only to supply Drifter parts to service about 1,000 aircraft flying around the globe. But early demand has staffers shipping a few kits even while they complete the factory. Lockwood also plans to deliver full Air Cam kits bringing this hugely delightful aircraft back to regular production.